I had to get organised! Started tidying away drawings into a folder, pattern scribbles into another folder, rolling up yarn and packing WIP's and yarns into their bags or baskets! I sat down to update my to-do-list - on which I only noted projects that can reasonably be completed within the next four weeks or so! 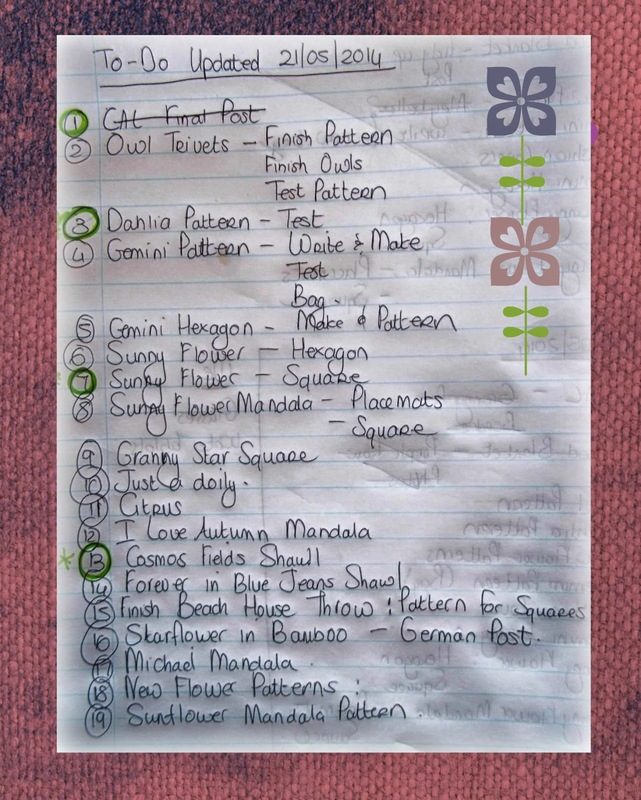 I LOVE a forcefully scribbled list! Indicative of my absolute determination to work through such list - I have already crossed one item off!! The BABY GROOVYGHAN - now washed, tumble-dried and folded neatly on a shelf in my craft room (until I can make up my mind how to display it). The rest of my WIP's (tooooo many to mention) have been packed away until I have worked through my to-do-list! It seemed most sensible to start with the items that were either closer to completion or would not take up that much time. 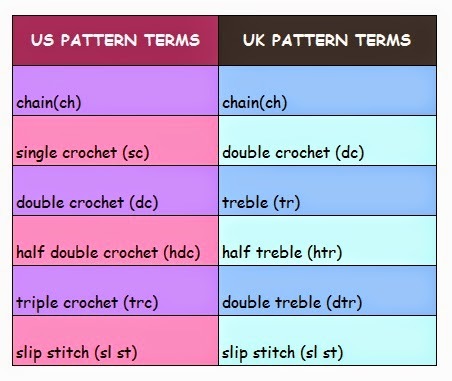 My patterns are all written in US TERMS. Row 1: 3ch (counts as 1dc) ; 11 dc into circle; sl st into 3rd ch at start to close (12dc). Break off yarn. Row 2: Join yarn into top of any dc, 3ch (counts as 1dc) 1dc in same space as join (2dc grouping); *2dc into top of each dc (2dc grouping)* *to* to end; sl st into top of 3ch at start to close (24dc). Break off yarn. Row 3: Join yarn in space between any 2dc groups; 3ch (counts as 1st tr ), 2trc into next space as follows - work the first and second parts of the stitch leaving last loop on your hook, into next space work the first and second part of 1 trc leaving the last loop on your hook (four loops on hook). Yarn over hook and draw through all the loops on your hook to form your cluster, 4ch; (into same space as last trc, work 1st trc of 4trc cluster; into next space work 2nd & 3rd tr of 4trc cluster; into next space work the last st of 4trc cluster, 4ch) x 11 (12 x 4trc clusters made); sl st into top of first cluster to close. Break off yarn. Row 4: Join yarn in 4 ch space between clusters; 3ch (counts as 1dc) 2dc, 1ch, 3dc in same 4ch sp as join; (into next 4ch sp, 3dc, 1ch, 3dc) x 11, sl st into top of 3ch at start to close. Break off yarn. Join as many as you like - to make a table runner or maybe even a shawl OR make the motifs on their own to use as coasters. When you reach the curve where your join would end if you were adding another motif made 3 x 3ch picots over the gap; 3hdc into the 1ch space where your join would start if you were adding another motif. Time to sit back and enjoy my handiwork with a nice mug of tea and a fresh Chelsea Bun! I love it thanks for sharing ! Such a pretty table runner! I will def. save the pattern and start working on it as soon as my other WIPs are done! Might take some time but will get there! Hi Zelna. Thank you so much for your pattern. It is beautiful and the colours you have used are awesome. I will, someday, make this!! Very pretty flower!! Love the colors too! Thanks for the tutorial. So beautiful! I love this motif. Thank you very much for sharing! Gorgeous! I love it! Thanks for sharing! Thanks for sharing. I have nearly finished and it looks awesome!